It's CODE RED VS. X-FORCE. Who is Code Red? How about Red Hulk, Deadpool, The Punisher, Elektra. Thundra and The Crimson Dynamo. What terrible secret could bring this group together -- only to run headlong into the deadliest team of X-Men? 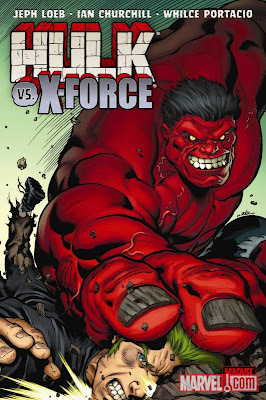 All this -- and wait until you see RED HULK VS. WOLVERINE! Superstar scribe Jeph Loeb is joined by art team Ian Churchill and Mark Farmer as the epic saga of the Red Hulk continues!